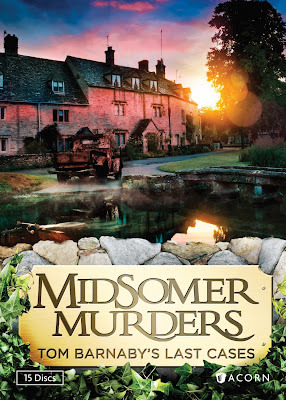 I was reading my review I did last year for the DVD set Midsomer Murders: Mayhem & Mystery Files and I was thinking how strange it was to have a period of my life without having this series I could go back to again and again. When I wrote the first review for this series, I knew I was going to like it but I was really surprised by how much I liked it. That DVD set is one that I go back to often. Luckily I have a short-term memory so I am not always sure who the murderer was but I really enjoy the settings and main characters. 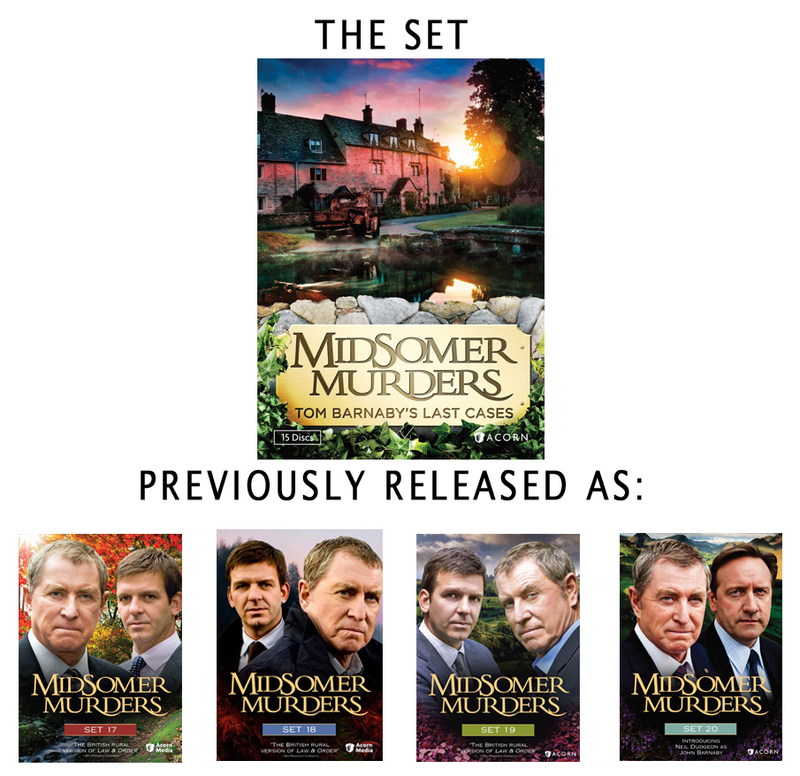 When I was able to review this new set, Midsomer Murders: Tom Barnaby’s Last Cases, I was very happy because I was able to see more great episodes of this series starring John Nettles as Tom Barnaby and Jason Hughes as Ben Jones but sad as these was the final episodes with Tom Barnaby. I don’t know what I am getting so worked up about, he had left two years ago but I hadn’t seen it yet. How would he go? Tom Barnaby is truly one of the great characters in British television. He holds many of the traits of a seasoned detective with one of the traits being patience. It is painfully obvious how his Sgt. is ill-prepared to handle an investigation on the scale that Barnaby can with his final episode really punctuating what an amazing character he is for the series. Yet, I am getting ahead of myself. What about this set? 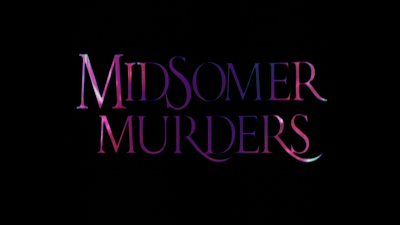 What we get in Midsomer Murders: Tom Barnaby’s Last Cases is Series 12 & 13 of Midsomer Murders. This was previously released as DVD Sets 17, 18, 19, and 20. I have learned that I do not want to live in any of the Midsomer villages. Not one of them is good if you want to live. Yet, the villages of Midsomer are beautiful. They are often sprawling English countryside with gorgeous manor houses. We also get villages that have bustling activity. There are a lot of events, fetes, and general get-togethers that allow people to mingle and interact. 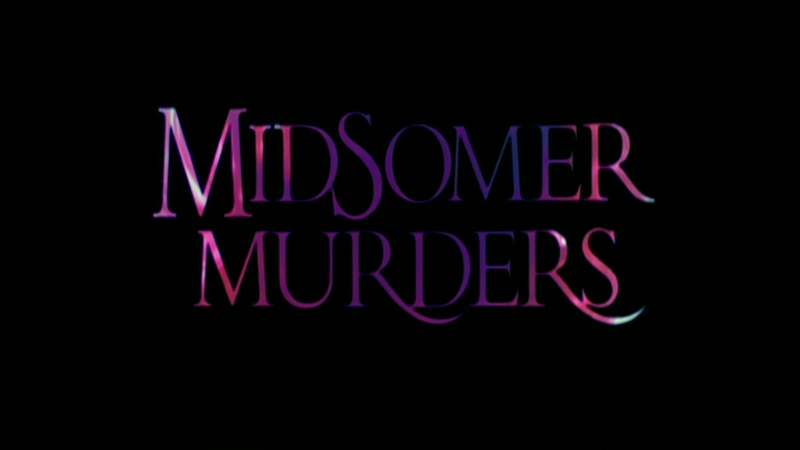 Perhaps that what I like best about the series is that these murders are not stereotypical inner-city sort of affairs. These are not grungy dirty back alley criminals. These are often people with high standing in the community. Murders are a big deal; the series never “sends up” the tragedy yet the murders themselves can sometimes have an eccentric over-the-top feel to them. Some examples, in the episode Secrets and Spies, the Beast of Midsomer comes out and leaves large gashes on their victims which cause death. Where else can a murder suspect be a cat burglar known as The Creeper? What if the settings are too English for you? In that case, how about when someone dies in an old-style Western gunfight? We get a total of 15 stories and the outlandish circumstances are one reason why this series is so appealing. There are also the guest stars that show up in the episodes too. We get Susannah Harker in one of my favorite episodes from the set. The episode is The Black Book is a story of an old woman who has a painting that she doesn’t realize its worth. Peter Davison puts in quite a nice performance as a drunken man named Nicky in Secrets and Spies. What I like about him in that episode, he looks like he is having a great time with everything. It’s very enjoyable plus he is playing a role I have not seen him play before. 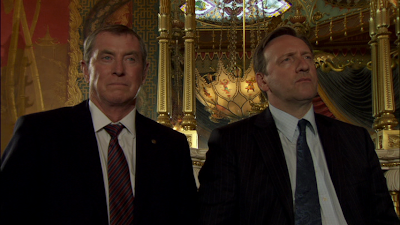 There is even a guy named Neil Dudgeon who puts in a couple of good performances too. 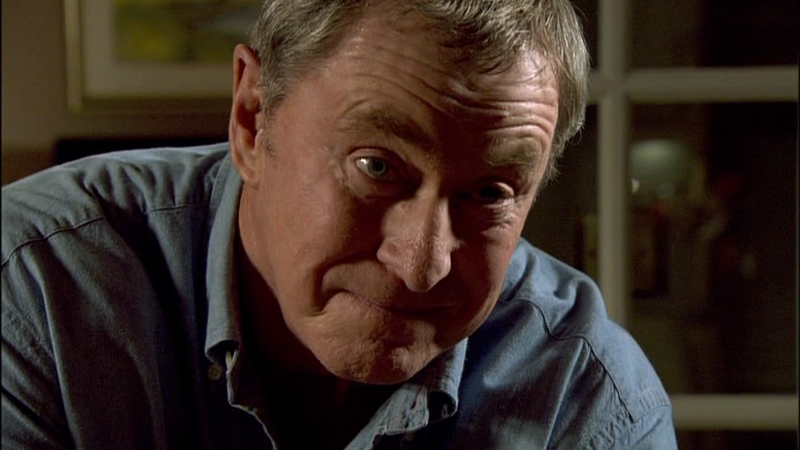 Neil plays John Barnaby and we are introduced to him in an episode called The Sword of Guillaume. A lot of the story takes place in Brighton which requires Tom to call on his cousin John. I don’t know if at the time anyone knew of John’s future role in the series but it doesn’t matter because he is so natural. The way the John Nettles and Neil Dudgeon play these roles together is a lot of fun to watch. The two characters are good friends with slight amount of competition between the two of them. They work well together and it would have been fun to see more episodes with the two of them solving crimes together. The relationship between Tom and his Sgt. Ben Jones is still strong. They respect each other though it is always fun to see Barnaby pull rank on certain situations. I did feel that some of the Jones’ moments with some of the episodes were too comedy-driven. I think it has always been there but it is even more prevalent here. One of the finest relationships in the series is one that can almost easily be forgotten as we get involved with “the case”. The relationship between Barnaby and his wife Joyce is really strong. Joyce is a very patient woman as she has to deal with calls in the middle of the night and the possibility of her husband getting injured or killed. In this set, there are a couple of times where Joyce comes face to face with the case itself. One time she thinks she hits someone with her car in The Silent Land and she has a big role in Fit for Murder as she “discovers” the first dead body at a health spa. All the time, Barnaby is very concerned for his wife making sure she is OK. It is sweet to watch. This set has some real good episodes to it. Some of my favorites are The Black Book, Secrets and Spies, The Creeper (with Rik Mayall), The Great and the Good, The Sword of Guillaume, Master Class, and Fit for Murder. There are some real great moments. The Black Book is fun as it has that whole art culture and murders happen over ownership of pieces of art. Master Class is a creepy story about a girl named Zoe who has a ton of talent playing piano but much happens to her in this episode and it becomes really disturbing. Not all of the episodes are classic. One that comes to mind for me was Blood on the Saddle. It involves a Wild West Society which is not something I am a huge fan of watching. It’s funny because the menu for this episode shows Barnaby and Jones dressed in old west style clothing. I suddenly had a fear that we were going to be watching a “dream” episode where perhaps one of them is dreaming they are in the Wild West or something. Luckily that is not the case but that being said it was not a favorite. 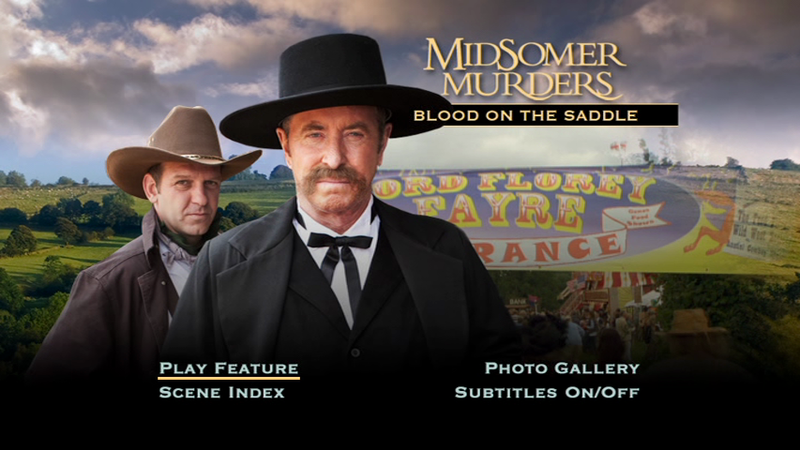 The whole theme of this set is the final episodes that feature Tom Barnaby and his last episode is especially good. 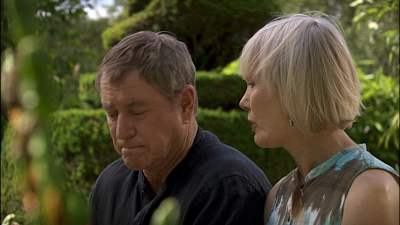 The episode is called Fit for Murder and focuses on murders that start to take place at a health spa that Barnaby and his wife are staying at for relaxation. The reason why I think this is such a great final episode for the character is that it handles the farewell of the character in the same vein of the character himself. It is subtle just like Tom Barnaby. When the episode ends, I realized I didn’t want this character to leave. 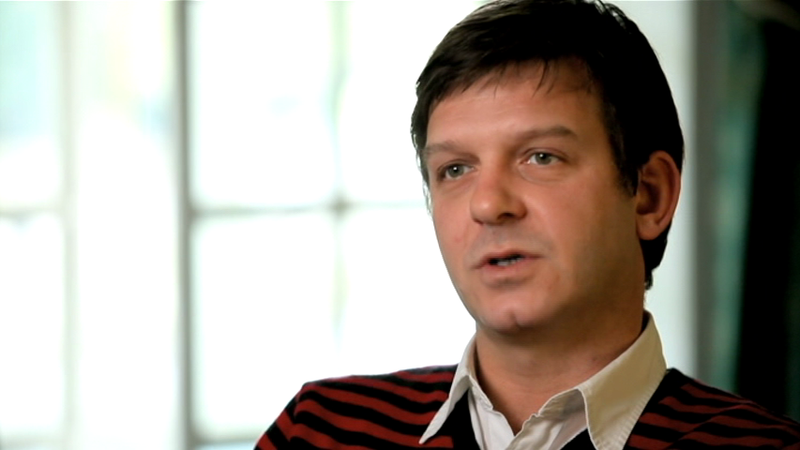 Tom Barnaby is one of the great detectives of British television and possibly all television. A much underappreciated gem. Interview with Jason Hughes: (23 min) This is a nice little interview that is with Jason Hughes aka Jones. Jason comes across as someone who is very humble and gives a little bit of background to his career and also to the making of the series. He talks about the great locations and he goes through some of his favorites deaths that have appeared in the series. A set this big is not going to have a ton of extras but it is a nice extra bit of value added. Acorn Media as usual also includes extras such as photo galleries and an essay called “Saying Goodbye to Barnaby” I am not a huge fan of reading long essays on TV screens but clearly people must like them since they end up in most of the Acorn sets. Even though by this point the series switched to HD, these are presented as SD DVDs. As this is a compilation of previously released sets, I understand why there is not a Blu Ray equivalent available. The picture quality is still fine yet some of the stuff is shot so well I would love to see this stuff jump off screen in high definition. I would love to see the greenery of the all the fields and trees in these episodes come to life. That is not to say this isn’t very good; it still is very nice. The picture is graded in a way to bring out the warmness of the image whether it is inside a pub or in the countryside. 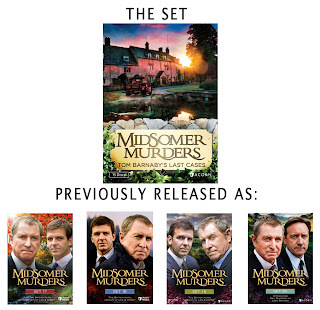 The packaging is just like the last compilation set that came out: Midsomer Murders: Mystery & Mayhem Files. It is 4 amary cases with either 3 or 4 DVDs in each case. It a heavy compact box of love. It’s nice to have these all together. Next week: I have some more reviews coming down the pike but I also am itching to get back to some randomly chosen series. Some titles I may do includes possibly more Dad’s Army and the Peter Cushing Sherlock Holmes series. Also the fourth installment of 50WHO should be posted sometime in the next couple of weeks.